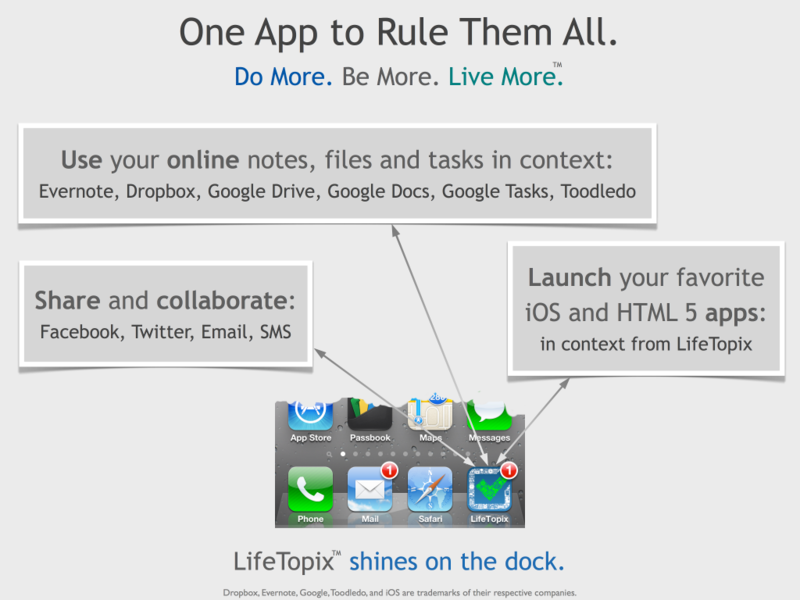 When we set out to build LifeTopix, we were not trying to build yet another task app. Or list app. Or notes app. Or shopping app. There are lots of those. Some of them are very, very good. A huge number of people find those apps sufficient for their needs, and many are in fact delighted with them. But at LightArrow, we look at organization and productivity differently. Most users store their personal information through a heterogeneous set of software tools. For example, they might use: Dropbox, Evernote, Google Drive and Docs, etc. to manage their life information. They collaborate in multiple ways — Email, Facebook, Twitter, Messaging, etc. They track things they need to do in different ways. For example, they use Google Calendar, Toodledo, Google Tasks, other online calendars, and other tools. Moreover, they have a lot of data, files, media, apps, etc. on their iPad, iPhone, or iPod touch. Working directly with our users to understand how they get things done, we’ve built LifeTopix to be the “superapp” — or “one app to rule them all.” This allows our users to use the software they love — and we went miles further by putting everything in context for them. This gives them an organizational paradigm that goes across several relevant topics in their lives — beyond anything any other app even attempts to do. We believe our “super app” shines on the dock of the device. In fact, most of our users see it as a gateway to organization, on the device and in the cloud. An app that removes the need to be constantly hopping between other apps does rightfully belong on the dock — used multiple times every day, just like the email app or the phone app itself. Users want to accomplish much more with the apps they invest their time into. We have raised the bar, and our users agree. See our Testimonials to learn more.